Food52 breaks down the ultimate DIY project for autumn. 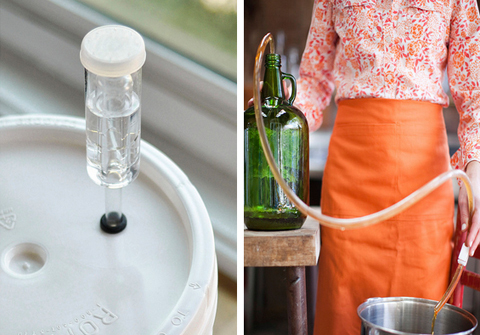 The Kitchn‘s Emma Christensen shows us a way to ferment and bottle apple cider. Emma is the author of True Brews: How to Craft Fermented Cider, Beer, Wine, Sake, Soda, Mead, Kefir & Kombucha at Home. Hard apple cider was one of the first recipes on my list when I started working on my homebrewing cookbook, True Brews. Growing up in Minnesota, I was raised on good, local apples and the kind of cider that makes you smack your lips and sigh with happiness. I just knew that this kind of cider would make a stellar fermented beverage, something with only a passing resemblance to the sweet stuff generally found in stores. And I was right! Fizzy hard cider has become one of my favorite things to brew (and drink! ), particularly in the fall when I can get fresh-pressed unpasteurized cider from the farmers market. This cider is dry in the sense that it is not very sweet-tasting. All the naturally occurring sugars in the apple juice become yeast food. We’re left with a hard cider that has a snappy-tart flavor, a refreshing bitterness, and an astringent edge. The balance of these flavors, as well as any lingering sweetness, depends on the apples going into your cider. If you are buying your own apples for pressing, get a mix of different apple varieties (15 pounds of apples will give you 1 gallon of cider). If buying cider, choose one with a nice complexity of flavors. If the cider ends up a bit too dry for your taste, you can sweeten it up just before bottling. All brewing-specific ingredients and equipment can be purchased at your local homebrew store or online at a place like Northern Brewer. If you already have a homebrewing kit, you can reuse your glass jug, air lock, racking cane, siphon, and hose clamp for this project. After the cider is sterilized, prepare the yeast starter. Sanitize a measuring cup, a 1-pint canning jar, and a stirring spoon. Scoop out 1 cup of cider and pour it into the canning jar. Pour the yeast over top and cover the jar with a piece of plastic wrap secured with a rubber band. Give the jar a good shake and let it stand for 1 to 3 hours. It will become foamy, and you will see tiny bubbles popping on the surface of the liquid. Once you see some sign of activity, the starter can be used. Pour the starter into the cider along with the yeast nutrient, acid blend, pectic enzyme, and tannin. Stir vigorously to distribute the yeast and aerate the cider. Snap the lid back on and reattach the air lock. You should see active fermentation as evidenced by bubbles in the air lock within 48 hours. Let the cider ferment undisturbed for at least 3 days or up to 7 days, until fermentation has slowed and the sediment created during brewing has had a chance to settle. At this point, the cider is ready to be transferred off the sediment and into a smaller 1-gallon jug for the longer secondary fermentation. Sanitize a 1-gallon jug, its stopper, the racking cane, its tip, the siphon hose, and the hose clamp. To siphon the cider into the jug, place the bucket of cider on the counter and position the empty jug on a chair at least 1 1/2 feet below. Attach the hose to the smaller “hook” of the racking cane. Slip the hose clamp over the unattached end of the hose. Run tap water through this end of the hose until it streams fluidly out the other end of the racking cane. Quickly clamp the hose shut, trapping the water inside. Attach the tip to the racking cane and place this inside the container with your homebrew. Lower the open end of the hose into the empty container and release the clamp. This will start a siphon, pulling the cider through the hose and into the jug. Siphon all of the cider into the jug. Tilt the bucket toward the end to siphon all of the liquid. Stop when you see the liquid in the hose becoming cloudy with sediment. Seal the jug with its stopper and insert the air lock. Let it sit somewhere cool and dark for another 2 weeks. 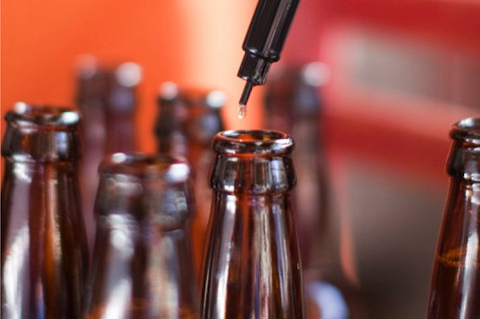 To bottle the cider, sanitize a stockpot, a hydrometer, ten 12-ounce beer bottles or five 22-ounce beer bottles, their caps, the siphon hose, the racking cane, its cap, a measuring cup, and the bottle filler. Siphon 1/2 cup of cider to the hydrometer, and use this sample to determine final gravity. Drink the cider or pour it back into the jug once used. Pour the corn sugar solution into the stockpot. Siphon the cider into the stockpot to mix with the corn sugar solution, splashing as little as possible. Scoop a little cider with the measuring cup and give it a taste. Add Splenda (or other nonfermentable sugar) if a sweeter cider is desired. Attach the bottle filler to the open end of the siphon hose and siphon the cider into bottles. Cap and label. Let the bottles sit at room temperature out of direct sunlight for at least 1 month or store for up to a year. Refrigerate before serving. Reprinted with permission from True Brews: How to Craft Fermented Cider, Beer, Wine, Sake, Soda, Mead, Kefir & Kombucha at Home by Emma Christensen, copyright © 2013. Published by Ten Speed Press, a division of Random House, Inc.